Samuel Tracey, a Science Communication MSc student at Imperial college investigates the importance of science communication when it comes to risk management, especially since last month, six scientists were found guilty of the manslaughter of those who died in the L’Aquila earthquake in 2008. It illustrates that getting the science right is not enough: communicating it is at least as important. Almost as soon as my colleagues and I had started our masters degrees at the Imperial College Science Communication Unit, the topic of science communication itself found itself in the headlines. Six Italian scientists were sentenced to six years in jail not, as some of the papers misreported, for failing to predict an earthquake, but for failures in their communication of the risks to the people of L’Aquila. The case shows how the communication of science can be as important as the science itself. Failure to communicate properly can lead to anger, blame and even death. In April, 2009, a team of scientists were sent to L’Aquila, Italy, to quell public anxiety caused by two factors: a swarm of seismic tremors in the region that persisted for several months, and the warnings of an amateur scientist who was predicting an earthquake based on his measurements of radon gas, an unproven method for predicting earthquakes. 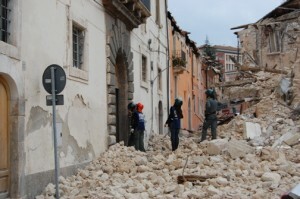 The committee of scientists held a public meeting and a press conference, which the residents of L’Aquila have since claimed left them reassured that there was no threat of an imminent earthquake. Their confidence was misguided; five days later, L’Aquila was hit by a magnitude 6.3 earthquake, killing 309 people, injuring more than 1500, destroying 20 000 buildings and temporarily displacing 65 000 people. The scientists, on the other hand, claim that they are being made scapegoats in a tragic situation and hold that they said nothing that the victims of the earthquake should have taken as a reassurance. However, last month a court found the six scientists involved guilty of manslaughter and sentenced each of them to five years in prison. The Royal Society (RS) and the US National Academy of Sciences (NAS) condemned the court’s ruling, arguing that such a decision could lead to scientists being “afraid to give expert opinion for fear of prosecution or reprisal”. But it should not be thought that their viewpoint represents that of all scientists. Several scientists from the fields of seismology and risk management have stated publicly that the Italian scientists deserve some kind of sanctions even if not prison sentences. I recently went to a Nature Live lecture at the National History Museum, where David Alexander, professor of risk and disaster management at UCL, London, spoke about the case. His words stood in stark contrast to those of the RS and NAS and came from one with much more knowledge of the situation: he knows at least some of the convicted scientists personally; he has visited L’Aquila on several occasions, himself having a home nearby. He has examined all the seismological data from the lead up to the fatal earthquake as well as studying, in detail, all the statements made by the scientists to the public prior to the earthquake. He strongly criticised the scientific committee for being so categorical in their reassurances, making statements such as “there will be no earthquake”. Such statements, he said, were not justified by the data, nor the precedent of earthquakes in the region and they ignored the risk posed by the age and fragility of the buildings in L’Aquila. Professor Alexander went on to describe the scientists’ behaviour as “arrogant, irresponsible and not justified on the basis of the scientific data”, and said that he “doesn’t feel a great deal of sympathy” for the convicted scientists, although he qualified the last statement with his belief that he expects the jail sentences to be revoked upon appeal. But he was clear that he believes they deserve some kind of sanctions. When one sees that the communication of science to a non-expert public can be a matter of life and death, one can recognise why Professor Alexander might be so harsh in his condemnations. It is not enough for scientists to say that they understand risk and uncertainty in different ways to the public. It is their responsibility to convey those differences so that the public can make an informed choice. If scientists fail to do this, then their words, as has been shown, could cause more harm than good. The alternative, silence, is not an option: it could result in harm and even death. So the only option is for scientists to realise the importance of communication. They must know their audiences’ abilities and needs; they must learn clarity of explanation. Those given the responsibility for assessing and managing risk must learn the meaning of the word “responsibility”. Perhaps prison sentences are too harsh, but whether scientists should be held legally responsible for failures of communication misses the point: they have a moral responsibility. Scientists must learn from L’Aquila, but they need not be afraid, as the RS and NAS suggest. They merely need to realise that their words carry weight; they are, rightly, seen as authoritative. Their words result in actions and those actions can save lives or end them. So scientists can no longer hold the view that data speaks for itself: they must be the spokesmen for the data and what they say and how they say it matters as much as the facts themselves.